Vertical or horizontal 1, 2 or 4 spindle gundrilling machines for small holes below Ø6mm and up to 300mm deep with close pitch centres. Multi-axis CNC combination deep hole drilling and milling machines for one-hit machining. Ideally suited for the mould tool industry. The Centeplex 6-axis gundrilling and machining centre is able to produce deep holes Ø5mm to Ø80mm up to 2,000 mm in depth while having the capability to perform conventional milling operations. Multi-spindle vertical machines used for drilling flat pellet dies used in the food and biomass industries. 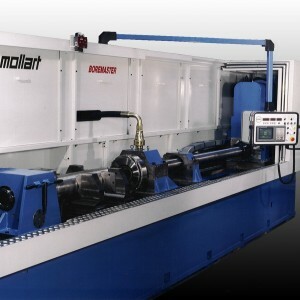 6-axis full CNC controlled machine with auto-change of gundrills and milling tools to facilitate lights-out manufacture. HD BTA machines for drilling from Ø18mm to Ø200mm and depths of 4000mm. MD BTA machines for drilling from Ø18mm to Ø65mm and to depths of 3,000mm. Microsprint 2 or 4 spindle horizontal gundrilling machine for holes from Ø0.5mm to Ø6mm to depths of 300mm.